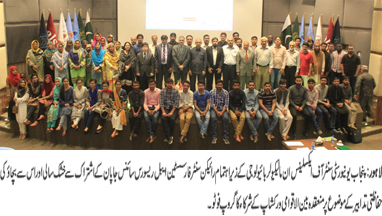 CEMB organizes joint research workshop on "Drought Stresses, Challenges for Agriculture and Mitigation Strategies"
LAHORE: (Sunday, March 18, 2018): Punjab University in collaboration with the RIKEN Centre for Sustainable Resource Science, Japan, organized an international research workshop on “Drought Stresses, Challenges for Agriculture and Mitigation Strategies” in the Centre of Excellence in Molecular Biology (CEMB). Dean faculty of Life Sciences Prof. Dr. Muhammad Naeem Khan in his inaugural address to the workshop urged that Pakistani agriculture scientists should divert focus to the development of drought resistant agriculture varieties like cotton, rice, wheat and vegetable to mitigate the water shortage and climatic change in the country. He appreciated the role of CEMB as being the most productive center of the Faculty of Life Sciences. Around 100 participants attended the workshop Eminent Japanese plant scientist Prof. Dr. Motoaki Seki, Team leader, Plant Genomics Network Research, RIKEN Centre for Sustainable Resource Science and Dr. Khurram Bashir joined the workshop as international speakers. Mr. Saleem Raza, Joint Secretary, Food Agriculture and Research Ministry; Dr. Ghazanfar Ali Khan, Additional Secretary, Agriculture Department of Govt. of Punjab and Syed Hassan Raza, Director, Neelum Seeds, also participated in the high level intergovernmental research project development workshop. Prof. Dr. Tayyab Husnain (Director, CEMB) briefed the honorable guests and participants about research activities done at CEMB. Syed Hassan Raza gave a talk about drought condition in Pakistan. He appreciated the productive research done at CEMB. Dr. Motoaki Seki gave a lecture about research done at RIKEN, Japan. Dr. Khurram Bashir specially emphasized on project of mutual understanding between CEMB and Plant Genomics Network Research Team, RIKEN, Japan. Dr. Bushra Rashid presented the vote of thanks to the guests and said this workshop would definitely have solid impact on bilateral relations between Japan and Pakistan.